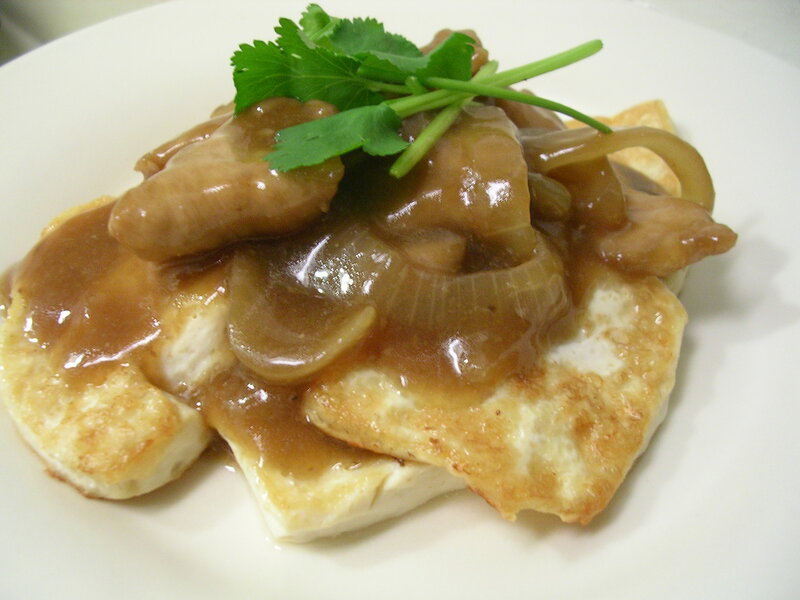 I know, I know… nobody uses silken tofu to make pan fried tofu chunks because it falls apart too easily. But I had a dinner to whip up and what I had at hand was silken tofu. My boyfriend told me that his family sometimes makes a dish where they pan-sear slices of tofu and then top it with beef in a brown sauce. That sounded really good to me, but I was a bit skeptical about getting the silken tofu to sear without breaking it up into tiny chunks. I went ahead and tried it anyway though! I used pork instead of beef, and added a bunch of onions to the brown sauce. It was amazing! 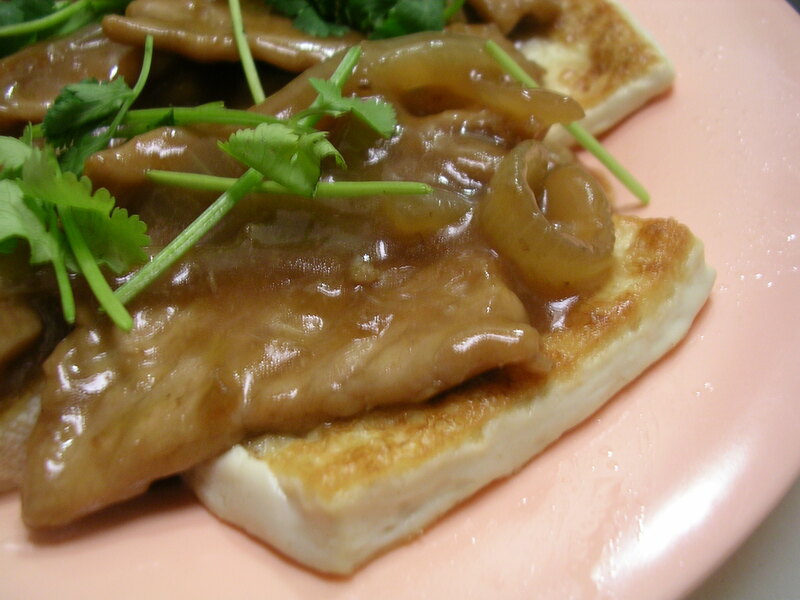 Seared silken tofu has this delightfully crunchy skin and a warm soft tofu center that just melts in your mouth… and topped with the pork and onion gravy, the flavor is just right! I had to experiment with a few pieces of tofu before I got going with the easiest searing method – but that means you won't have to! :) It takes a little bit of care to make sure you're not tearing the tofu up to shreds, but the result is so worth it. 1. Wash tofu blocks and cut into slices that are 1/2 x 1 x 2 inches in dimensions (about the length and thickness of your index finger), cutting it so that the "skin" side of the blocks are always along the thin edges of the slice – this helps hold the tofu together. To make this easy to figure out, just always place the skin side of the tofu down on the cutting board, and proceed to cut 1/2 inch slices from the top down. 2. Cut pork into thin strips, and marinate in the soy sauce, rice wine, sugar, cornstarch, garlic powder, onion powder, and white pepper powder for 10 minutes. 3. In a hot nonstick skillet, sautee the onions until starting to turn translucent. Remove from pan and set aside. Sear pork slices until mostly cooked through on both sides, and add back onions. Pour in about 3 cups of water (adjust as desired to get amount of sauce). 4. To make the sauce, stir in teriyaki and oyster sauces to achieve desired saltiness. It should be a rounded flavor with some sweetness. Stir in a slurry of 2 tbsp cornstarch in 1/4 cup of cold water, and allow the sauce to come to a boil to thicken. Add more cornstarch slurry if needed – you want to get a sauce consistency that is somewhat thickened, so that it will sit nicely on top of the tofu later. 5. In a clean non-stick skillet coated with vegetable oil, heat to medium/medium-high (about 6 on a dial from 1-9). Carefully lay down 8 to 10 pieces of your tofu with the flat side down. Don't let the tofu touch each other or else they'll stick later. Close the lid of the pan, and allow to sear approx 5 minutes, removing lid occasionally to release steam and remove water collecting on the top of the lid (you don't want too much of that to drip back into your pan). 6. Using 2 spoons, carefully flip each piece of tofu onto its back. The seared side should be golden. Continue to sear the backsides of the tofu pieces for another 4-5 minutes before removing from heat. Repeat with remaining tofu slices, and clean the pan in-between each batch if there are lots of little bits in the pan (don't want them to burn). 7. To plate: lay tofu slices out flat and spoon pork and onion gravy on top (I had more than enough pork gravy for the tofu I used – I had about 1 piece of pork for each piece of tofu). Garnish with fresh cilantro and serve immediately. Enjoy! This entry was posted on Wednesday, April 9th, 2008 at 6:10 am	and posted in Chinese, cooking, recipes, Uncategorized. You can follow any responses to this entry through the RSS 2.0 feed.